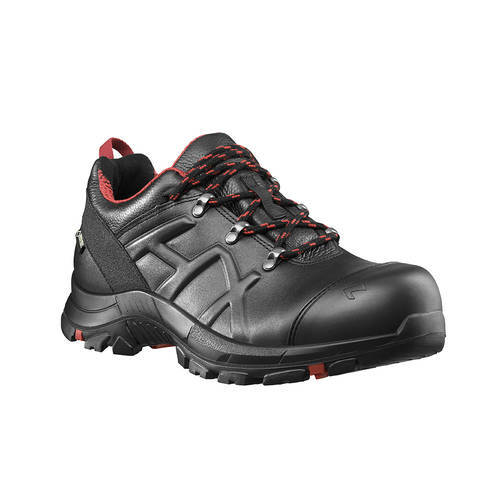 Product information "HAIX Black Eagle Safety 54 Low"
HAIX work shoes are especially designed for road maintenance and construction site workers who place the highest demands on their work shoes. The shoe is made of extra thick waterproof bull leather of the highest quality, with a thickness of at least 2.0 mm. This leather strength makes HAIX safety shoes particularly robust. The work shoes ensure the all-round feet protection needed for working on road maintenance or construction sites. The composite protective cap made of ultralight, fibre-reinforced plastic protects the toes from injury by, for example, falling objects. The shape of the toe cap leaves enough space for your feet, ensuring not only safety but also comfort at work. S3 safety shoes from HAIX are tested and certified according to DIN EN ISO 20345, and provide your feet with the necessary protection they need in demanding day-to-day operations. Further protection is guaranteed by the puncture-proof sole. The metallic insole is light and flexible, while the protective sole shields your feet from below, so that no nails, shards or screws press into the foot. The risk of tripping, slipping or falling is also reduced by the sole: The road or terrain profile of the rubber sole is extremely slip-resistant and highly resistant to abrasion. The insert of the safety shoe cushions every step and ensures good foot guidance, thus protecting the joints. Due to the high wearing comfort, your feet feel comfortable even after eight hours of work. The modern, lightweight design gives the work shoes the appearance of a sports shoe. The GORE TEX® membrane ensures protection from the weather. The shoe is completely waterproof and lets no moisture penetrate into your feet, even in heavy rain. At the same time the material is highly breathable, the shoe absorbs moisture and releases sweat to the outside. This ensures optimum climate comfort, especially if you move a lot between indoor and outdoor areas during work. In addition, the sole insulates well against cold, so your feet do not freeze even in winter. The S3 safety shoes are electrostatically dissipative. This means that the shoes meet the requirements of the ESD standard DIN EN 61340-4-3:2002. The sole is oil and gasoline resistant. In addition, the rubber material of the sole is non marking. The safety shoes do not leave any ugly streaks on floors, even indoors. Overall, the BLACK EAGLE SAFETY 54 LOW meets the highest standards for your personal safety at work. The high-quality safety shoes by HAIX are made of extra thick, robust 2.0-2.2 mm bull leather. Leather-based pigments reflect the sunlight and prevent your functional shoe from heating up. The lining material is resistant to abrasion and ensures maximum climate comfort, especially in the case of flexible indoor and outdoor operations and in warmer temperatures. GORE-TEX® membranes make HAIX safety shoes waterproof and highly breathable. The anatomically shaped, ultra-light toe cap made of fibre-reinforced plastic meets the highest safety requirements of EN ISO 20345 category S3. The insole of the safety shoe is comfortable, cushioning, moisture-wicking and antibacterial. The separate heel cup guarantees good cushioning and foot guidance. Three different insoles allow you to customize the width of your safety shoe individually. Basically, the article will be shipped with the red insole (medium). Additional Perfect Fit insoles can be ordered separately. The sole is constructed in a modern, lightweight sports shoe design. The rubber/PU profile is extremely slip-resistant and highly resistant to abrasion – the shoe is perfectly insulated, even in very cold weather. The PU damping wedge ensures a pleasant walking sensation. The rubber sole is oil and gasoline resistant. A flexible, lightweight, metallic sole insole makes the shoe puncture resistant, so that broken pieces, nails or screws cannot penetrate through the sole to the foot. The HAIX BLACK EAGLE SAFETY 54 shoes meet all security requirements of category S3: They are waterproof, oil and gasoline resistant, antistatic and penetration resistant. HAIX safety shoes from combine the comfort of a sporty sole with the highest protection. Order your S3 safety shoes from HAIX now.